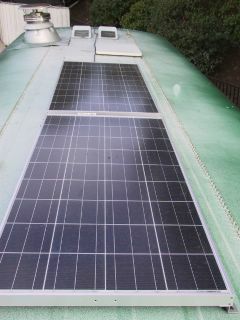 The solar pannels are in and functioning! Our system consits of two 125 watt pannels, a volt meter/charge controler and two 12 volt deep cycle batteries. Future plans call for an indoor, under bench battery box that will hold two more batteries,and the possibility of an additional pannel. So far we seem to have enough power for everything we need. Here is a run down of our appliances and use..
A 3.5 cubic foot nova kool refrriderator/freezer (on the number three setting).This is one of those ultra efficient refrigerators with a danfross compressor, a bit on the expensive side, but highly recomended and worth every penny),it draws 2.5 amps an hour but is only on half the time,depending on outside temp. We listen to our XM satellite radio from around 9 am to 10 pm, and often a few music c.d's as well. In the evening we may also watch a dvd or two. For lighting we use candles and firelight almost exsclusively ( though we do have the option of electric lights if needed). With all that, and being in southern california in winter, we have not gone below 12.5 volts on the meter.The real test will be later next month though when we plan on finding a nice boondocking place to stay for a bit while we finish up some cabinentry, and start on the water sytstem. We will be useing lots of power tools, which draw an enormous amount I am shure. With no back up generator, we may run into problems. On a different note...we had a lovely solstice/Yule! We went to the Santa Monica Mountains on the 21 of dec to make note of the solstice, the shortest day of the year..and the begining of the lengthening of daylight. One of my favorite times of year and favorite holiday. We exchanged gifts on dec 25 with family ( funny because they are all atheist jews and he and I follow a more earthy, pagan path..). Moss suprised me with a brand new simerman dulcimer. 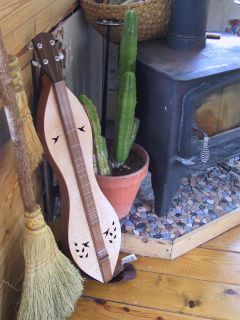 I have been playing the mountain dulcimer off and on for the last twelve years or so. 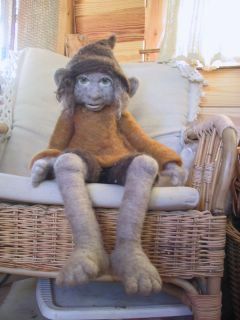 The one I had previously was badly damaged by the cold and damp when we lived in the tipi for all those years. This new one is the best sounding, most beautifuly crafted dulcimer I have ever heard or seen. It sings and plays like a dream ! 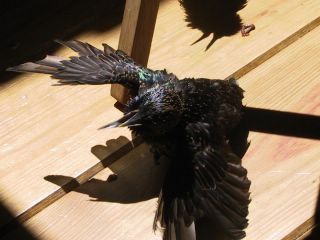 There are two hummingbirds for soundoles, and this is quite apropo as I love birds and used to rehab wild hummingbirds, as well as other songbirds. The symbol is very signifigant and inspiring to me. I suprised Moss with a banj- mo. This is a cross between a dulcimer and a banjo. Unfortunately, the man will not be finished makeing it until mid January. We look forward to creating and recording songs together as the two insturments are very compatible.For my little niece Winter, I made one of my wool sculptures. 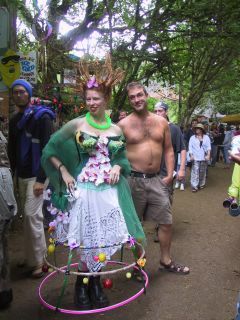 She seemed to like it quite a lot and I had much fun makeing it. 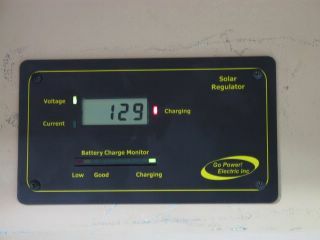 Volt Meter/Charge controler for solar pannels. 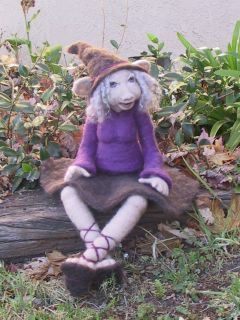 A wool sculpture I made for my niece, Winter, for the Yule holiday. It's been quite awhile since wr last updated everyone in regaurds to our bus conversion..so this post will be all about what we have been doing. 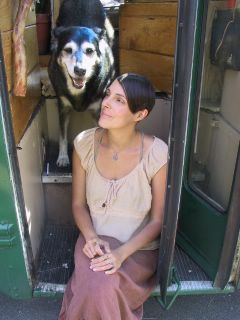 Since ariving here in southern california a few months ago, Moss and I have been living in the bus and working feverishly to earn enough money for our solar pannel system. When not working we spent a good deal of time living off and on at a campground on the beach. We also have been helping Moss's mom and dad fix up their house and get ready to move to Washington. Then finally, just yesterday, we were able to save enough to order two 125 watt pannels from RV Solar Electric in Az. Along with the pannels we gotall the wiring, charge controler/system monitor and mounting hardware, for whooping 1,440 dollars, with shipping ! Actually,I understand it's fairly simple to install..I guess we'll find out soon enough. This is great news as it means that finally we can begin to finish some of the woodworking stuff that we have had to put off due to the unavailability of electricity. We plan on working until January, then find a nice boondocking place to stay for a month or two while we finish up the bus...a la solar electricity. As a back up power source we will be making or purchasing a pedal powered bicyle generator for cloudy days. We hook it up to our bike tires and the battery bank,then take turns pedaling to power up the batteries ! There is another company, Sun Frost that makes almost the same model but charges over 1000 dollars as compared to ours which only cost 650 ! The only difference is the sun frost has extra thick insulated walls..but if you just glue the insulation to the Nova Kool model you get almost the same efficiency as the more expensive Sun Frost ! Aside from all that, Moss has been working on our veggie oil system. 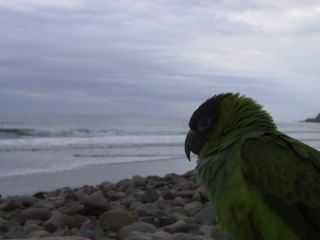 I will turn it over to him for the details now, but first a few photos from the beach..
At the Campground on the beach. 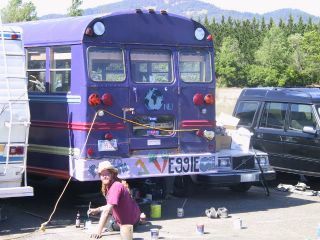 Joseph in one of his pensive moods..
Howdy, Moss here with another veggie oil bus update. This truly has been a learning experience and always a work in progress. That said there were a few problems that plauged our original system..
First problem is that because of the multitude of brass fittings ( used to make the different send and return lines fit together with the manual shut-of valves) we had many more instances to let in air. Air is the bain of diesel engines. To much air can stall the bus dead. 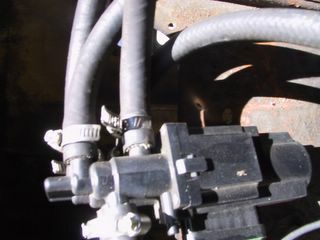 Second issue ( this should have been a no brainer in the first place ..) was that when we wanted to switch over to veggie oil from diesel or vice a verse, we had to pull over, get out of the bus, open the hood and swich over the four shut off valves. That was kinda a pain in the boody. Needless to say, this was one of the first things to change. So what did we do to rectify these situations? Really simple.I replaced all the manual shut-off valves with a Pollack six port silinoid valve. All the lines go in to the little black gizmo and can then be switched from the diesel/biodiesel tank to the veggie oil tank with one convenient switch, located with all the other switches near the driver area.We also replaced some broken copper pipe going to the veggie filter with flexible rubber hose. We have had hardly any trouble with air since we have modified the system.The only time we do is when I change filters. Because of the switch,however, I can now purge the veggie line of air by swiching back and forth between the two tanks and letting little bits of air in at a time. This allows the diesel side to take care of the small air pockets I let in. The next major changes we will be making is replaceing our 55 gallon veggie tank/barrel with a flat, stainless steel 85 gallon metal tank with a heater inside. Besides that the only other thing to do will be to replace our Goldenrod filter with a heated Raycor jet filter. After that our veggie conversion will be complete.In the meantime, everything is working very well, with few if any problems.These little extras will just help us in cold weather and with clearance issues for the tank. Pollack Solenoid Valve. Note the new black rubber tubes replacing the soft copper ones. events are a signal of something much greater. I do believe that what we are experiencing is the physical manifestation of a great cleansing and inevitable awakening of the human spirit/mind.The result of our collective conciousness struggling to free itself. A cosmic jump in the evolution of the human animal,paramount even to the moment when our ancestors came down from the trees and began walking up right. Paramount to the discovery of fire, or the wheel. If you are an intuitive or sensitive person...you already know this. Species evolve.If you believe this, then you must allow for the fact that, of course, this includes the human animal.It really is quite a beautiful thing..evolution. Contrary to the claims of many, evolution is not a proclamation against the existence of god, but is in fact god it's self. God in the act of creating god. A beautiful, miraculous pattern, central to all of life and repeated throughout the the universe on many levels..the growth,change and transformation of energy into new forms. Even Einstein said " energy cannot be created or destroyed"
So then,humans are evolving, including our minds and hence our consciousness as it relates to mind. In the coming years we MUST evolve..or our species will suffer incredibly as will many others. We must make that scary but necessary leap into the unknown. 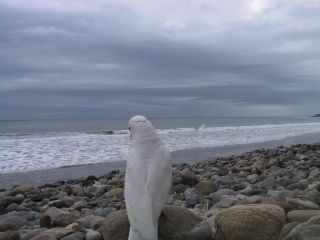 We must trust our hearts,leave our logical minds behind, surrender our egos collectively and not be afraid to believe. Listen to your heart,it is calling you to awake and join together to usher in this new age of awareness. This new cycle, or yuga. Our actions towards each other, including other species and to our sweet mother earth are hurting us all. We are killing the host on which we live and which gives us everything we need to support our material existence, and hence we are killing ourselves. We must adapt..we must evolve ..or our species and many others will suffer and die. The way we treat the earth and our brother and sister species is a direct reflection of how we treat each other. We are all one...literally...just reflections of each other. All of this has been written about and prophesised by various mystics for ages. Nearly every religious path has some version of these events. This progression is a natural one and I do believe other, similar species have gone through this already...and some have been trying to contact us and convey these messages . Every since I can remember I have felt all of this, as I know many of you have, deep within.It is time now to believe and not be afraid of that. Do not try to understand with your logical mind, you cannot, at least not yet. It is a different kind of understanding that is required here..a deeper, more subtle understanding, yet one that you feel with every cell of your being. 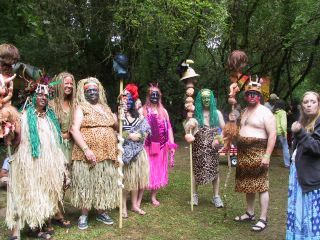 It is not a religious, or even a spiritual matter ...but a simple matter of the concious evolution of our human species. I believe that we will make the choice to consciously evolve.I have made that choice myself and I know, I see that every moment more and more people are. The polorization is almost complete and soon it will reach critcal mass and we will experience something akin to the hundreth monkey syndrome...and people everywhere will begin to awake. There is no stopping this awakening...it is already happening. You will likely not read of this in the newspaper or hear about it on cnn, but it is happening now, at this moment, in the hearts and minds of individuals the world over. 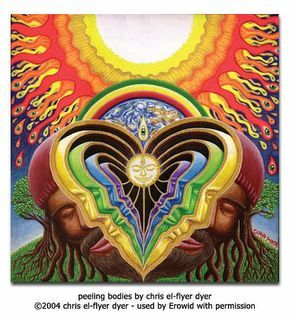 I love this painting by Chris Dyer.. I am finding it very time consuming and tedious to write out the details of our journeys lately. I have therefore decided, in the intrest of saving time and keeping things updated, to include more pictorial entries with my posts. That is not to say I will no longer be writing the details of our adventures at all, just that there will be more posts with pictures only in the future. 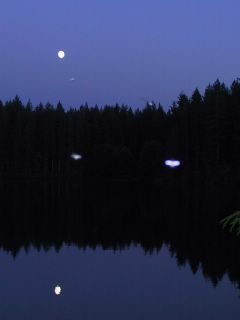 Besides, I rather like photography, and I am shure most folks are more intrested in the pics anyway. 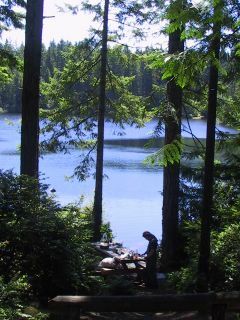 Here is a pic of the free campsite we stayed at in washington state.We stayed there almost two weeks and throughly enjoyed it. 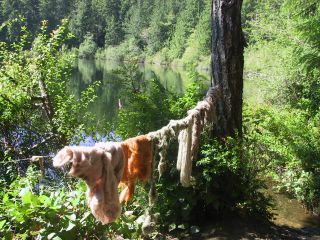 We swam in the lake every day and I spent hours felting ang dyeing, combing the surounding forest for dye plants . Moss had fun practicing his banjo and wrote some new songs. Some st Johnswort I found fry dyeing wool. 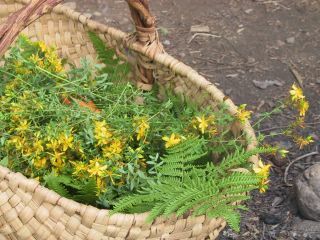 Here I am preparing the fresh st Johnswort for the dyepot. Freshly dyed wool drying on the line . 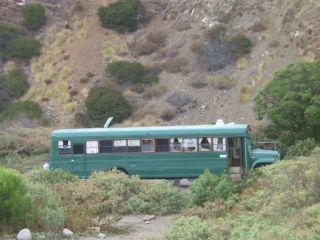 Pic of our bus from the campsite (we couldnt pull the bus down). 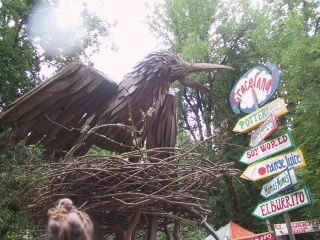 Here is one of the sculptures I made at the campground. Another shot of my newest creation. 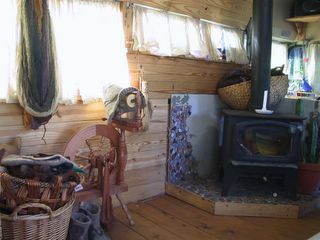 Here is a pic of how our bus is comming along lately.Obviously we have lots of finishing work to do ( like the mosaic on the hearth I have been working on forever ). On the wall is some of the yarn I recently made. 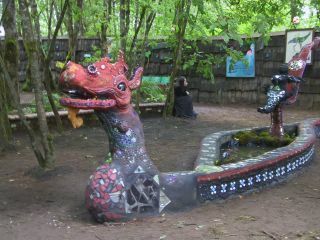 This is at the farieworld festival in oregon.Our friends got us on the work crew and we got to go in for free and I managed to sell two of my dolls there ! It was loads of fun. After the festival we visted friends and hung around Eugene for a week or so.This is a pic of Moss and some friends of ours on a trip to cougar and Hidden lake. 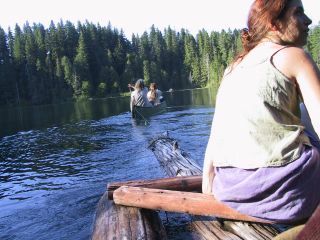 We had fun playing around on an old barge that someone had nailed together from old logs.We then tied it to a canoe and pulled it all around the lake. We got off on the other side and went for a nice hike. 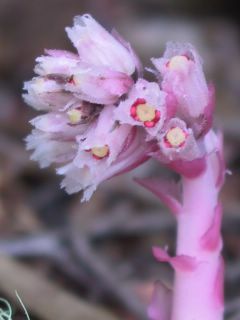 A really neat plant I found on the hike. Pippin suns himself on the floor of the bus. 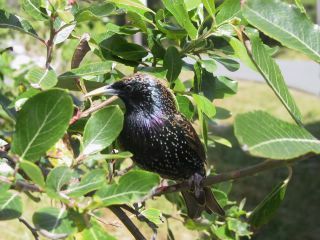 I know it looks like he is dyeing,but really he loves it.Starlings are very much sun worshipers. 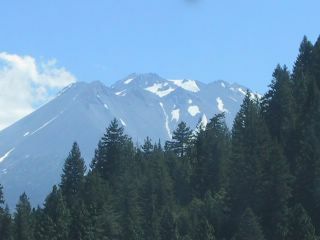 This is a view of Mt shasta ( northern california.) , as we make our way down to southern cal for some more initiative work. 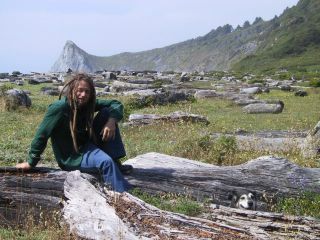 I have received several emails lately asking what 's up with the blog and what Moss and I are up to. The truth is I have been much to busy living life lately and have had little time to write about it. I will try here however to bring everyone up to date. Last place we left off, Moss and I had just arrived in c.a. We stayed a few weeks and visited many dear friends before heading off to Washington to work on a few initiatives. We made our way slowly up the cost,on us 101, through the redwoods, stopping at beaches and forests along the way, never going over 50 miles an hour, and not even that on the big hills.While stopped at a gas station in willits we got to chatting with some folks who lived in town.It turns out they to were doing a veggie oil conversion at a near by place known as the Energy Park. 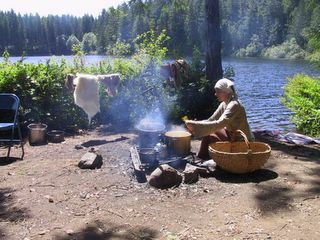 They invited us over to see the place and hang out for a spell. 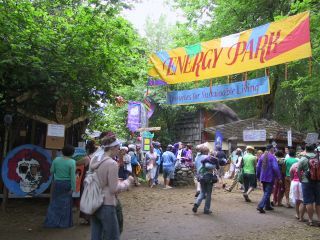 The energy park is a great little grassroots group of folk who help people convert their vehicles to run on WVO ( waste veggie oil). 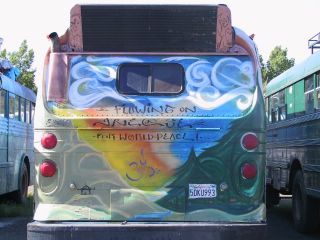 From what I could tell the place consisted of a shop and a large parking lot, filled with dozens of buses, from school buses to city buses and almost every one was beautifuly and artfully painted. We Immediately felt at home.
" hey mamma, we have some grub here, if your hungry", and she pointed to a wok set on the gravel parking lot. I took her up on her offer, and after much hugs and introductions, we all sat down to share a meal and chat. Turns out they had just spent the last week at the park converting their bus to wvo (waste veggie oil), with the help of the fine people at the energy park, and would be leaving the following day. Some other kind folk we met offered for us to come back to their place for a few days to rest and hang out.Unfortunately we could not take them up on that as we had to get to Washington and work . We left near dusk with promises to return for a visit soon. We continued up the coast on us 101, going ever so slowly and carefully through the enormous hills and windy roads in the mountains. When we reached the Oregon border we realized the roads were entirely too narow and windy for our big bus, so we cut over to I 5 and Grants Pass, via an even more insane road. At times it was one lane, no railing and vertical cliffs. We had driven the 101 from c.a to Oregon more times that I can count, but never noticed how trecherous the roads were, until we drove it in the bus. You just cannot be in a hurry in a school bus, I kind of like that. 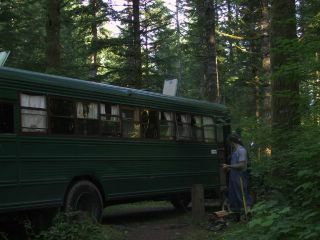 The bus did wonderful though, we went slow and didn't overheat once. The airbreaks worked great , maintaining their pressure well. Whats more is we did it all on FREE clean burning waste veggie oil ! 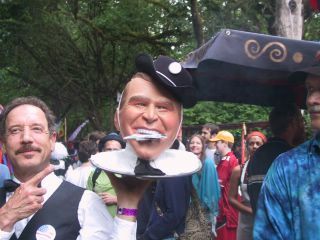 I gotta tell ya, it does feel good knowing we are not contributing to our current wacko goverments war for oil. Once in washington we parked in the Walmart parking lot for a week or so and worked the initiative at the surounding stores. 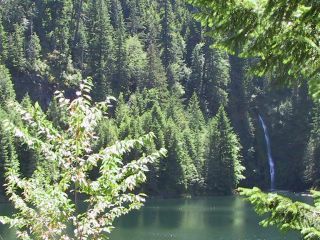 That did well for us, and we then headed down to Cougar (terwilliger hot springs ) in Oregon, for the weekend of the fourth. On our way to cougar we stopped for a few days at a free campground, listed in my book, Guide to Free Campgrounds of the West. 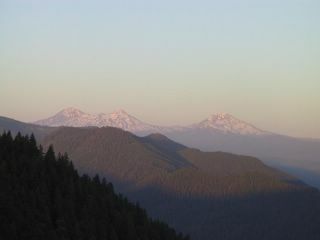 The map showed it as being right off I 5 on the way to Oregon, so we figured it would be a great place to stop for a few days. What an adventure that turned out to be. After driving for what seemed like forever through narrow,very steep and windy BLM roads, we finally found the road we were looking for, or so we thought. The road ,we quickly realized ( unfortunately not quick enough) turned out to be a very narrow logging road, one that became even more narrow the further we went. 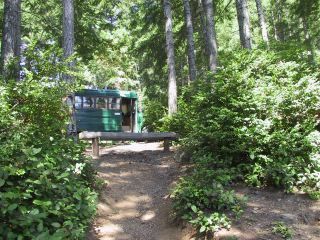 Eventually we were forced to turn our huge 37 foot bus around on this road,with a several hundred foot vertical drop off on one side, and a ditch on the other. Well, somehow, I am still not quite shure how, we did manage to get it turned around and headed back out, much to my great relief.Once back to the main road,we were still many miles from nowhere, in the middle of the forest . Uh oh,...it was too late to turn around at this point.The men in the orange jumpsuits stared open mouthed at us in our giant green bus, I am shure it is not every day they see something like that out there. Moss opened the door and asked if the fellow knew of the campground we were looking for or how to get back to town,...in the distance I could see the other inmates jumping around and slapping their hands, hysterical with laughter. "uh,..I dun no,.." he stammered, looking away. Moss and I quickly fell over one another in a feeble attempt to explain what we were doing parked in the middle of the facility conversing with an inmate. He didnt want to hear it, and cut us off, trying very hard to remain composed, and stated simply and directly that we were to turn our bus around, there ( he pointed) and get out of here. End of story. We turned the bus around, not without great difficulty, and much to the amusement of the inmates, and drove away, waving as we went. Down the road another 10 miles we did find the campsite, where we stayed for three days before moving on to cougar hot springs in Oregon, one of our all time favorite places. 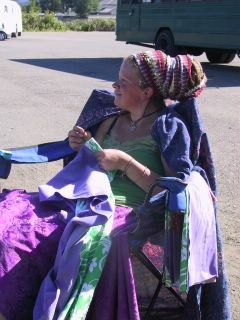 You meet a lot of intresting people sitting around naked in the springs there.Moss and I were not there more than thirty minutes when we were invited to a gathering / party down the road a piece at hippy hollow, a forest campground in the national forest and long time hangout in the area. 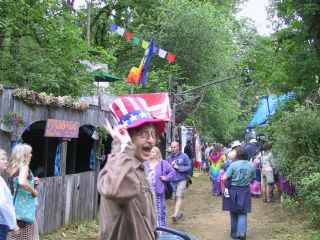 It was so wonderful to be around rainbow family, especially since we were not able to make the national gathering down south. We saw many old friends and made many new ones during the weekend. 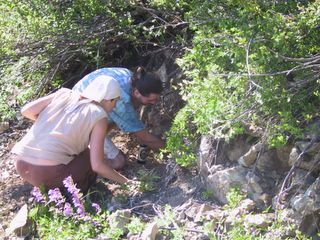 We even got to go crystal minning on top of the mountain with our friend Shawn, and found several good size pieces. 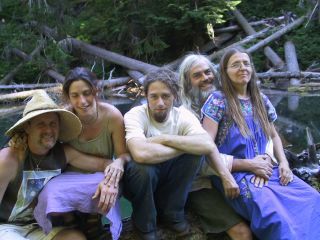 We spent a week in the mountains there soaking in the hot springs every morning , then heading back to camp to relax in the woods, play music and talk. 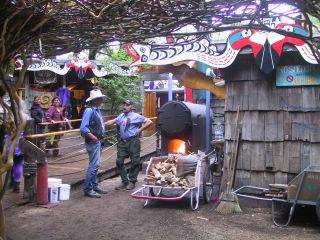 At night there was live music, blazing campfires and good conversation. 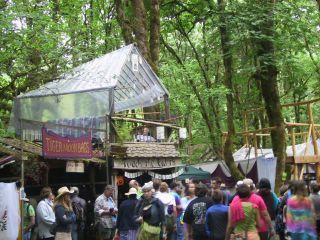 We headed back to Eugene on the fith( bringing with us TEN riders to town) just in time for the Oregon Country Fair the following weekend. The Oregon Counrty Fair is not your mom and dads country fair. 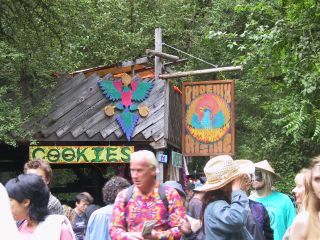 There is no way to acurately describe this beautiful gathering that has been taking place in the woods outside Eugene for 34 years. I have included lots of great photos to help you get the idea though. 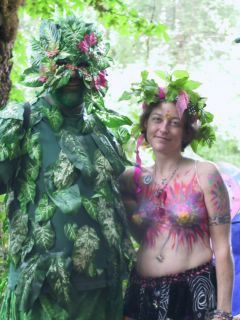 Moss and I attended the three day festival on friday night and had a great time bumping into old friends, listening to music and enjoying all the amazingly talented artisians.We headed back to washington on the ninth to work some more on an initiative, this time in Renton. 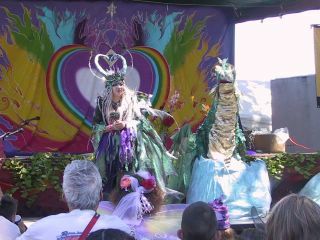 The faery fest is a beautiful, grand celebration of all things fae !! 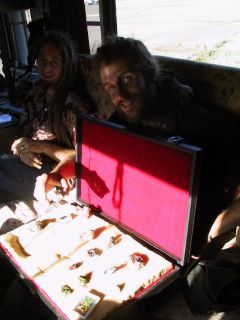 We have a friend who will be able to get us on the crew and a camping pass AND maybe even a spot to sell my art work. This is the PERFECT venue for my dolls, so I am now busily creating more dolls, our bus parked at the Walmart parking lot, while Moss works the initiative. 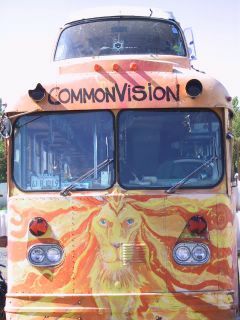 One of the bus's parked at the Energy park. Well,...we are back up and rolling again folks !! It took a bit of time, not to mention 860 dollars for a new laptop (groan..) but we did it. We are now back on line. 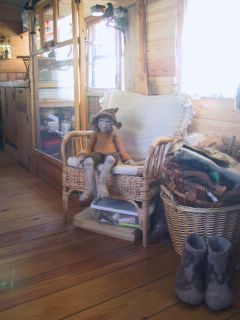 Moss and I have been working real hard making money, and have also had some time to work on the bus as well. Before I get into all that though, let me back up just a little to our cross country trip. I have to say a few words about our stop in New Orleans. What a beautiful, charming, magical city she is ! Now, I am by no means a city girl, in fact I prefer to avoid them at all costs. However, I have to say that I truly love that city, in a way I have never loved a city before. I had no idea it was even possible to feel this way about a city! I lived there off and on at various times in the past fifteen years. In my hitch hiking days I stayed there quite a bit, living out of my back pack, selling my jewelry and listening to some of the most talented unknown musicians play on the streets. It is an old town, established in 1718, with much of the original architecture still intact. It is also a magical place, rife with voodoo and voted the most haunted city in the U.S. Anyone who stays there long enough quickly learns that there is something undeniably strange and alive about it. Some say that it is Marie Lauvue, a famous voodoo priestess who ruled the town for years in the 1800's. They say she put a curse on the city that brings people back time after time,... often to make their graves. Speaking of graves, another odd thing about the town is that all the dead are buried above ground in mausoleums, and there are some truly gorgeous old graveyards. The town is below sea level, if you dig down even a few feet you hit water. Any dead burried here will float to the surface during heavy rain. At any rate, there was just no way I could ever drive past it without stopping in for at least a night. It was around six o clock on a Friday night when we pulled into the French quarter. We quickly found a place to park, no easy task on the narrow streets of the quarter, then hit the town. It was just as beautiful as ever. I visited some of my old haunts on Decatur street, had a few beers, checked out Jackson Square and just soaked in the vibes. We strolled down Decatur towards one of my favorite hangouts, Kaldis coffee shop. This was the place where one could always find good coffee and good people, usually hanging out front on the sidewalk, talking, playing music. When we neared what should have been the entrance to Kaldis, I looked, then did a double take, something was not right. This didn't look like Kaldis. A voice came out of nowhere, " Yeah, it used to be Kaldis, they closed down last year." I glanced down to see a somewhat disheveled looking fellow, with a banjo in his lap and rolling what could have been a cigarette. In front of him sat an open banjo case, a few crumpled dollar bills tossed in for looks.
" Bummer, I really loved that place "
"Yeah, everyone did" came his reply. Moss and I took a seat on the steps next to him, he passed me the "cigarette" and introduced himself. "Mad Mikes the name," he said extending his hand to Moss, then to me. We introduced ourselves and Mad Mike began to play. 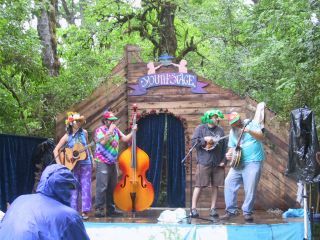 He was very good, his music a mix of traditional bluegrass with a contemporary edge. It wasn't long before a crowd began to gather. Someone turned the newspaper box on its side for a makeshift couch and some folks sat on the curb. I never quite understood it but there is a strange phenomena in this city. It is one that causes perfectly sane, well dressed people to just sit down on the sidewalk, and kick back as though they were in the privacy of their own living rooms. I am not just talking about travelers," bohemian " types and homeless . I mean, people who are well off , with houses, nice cars and important jobs. Maybe its the booze, maybe its the good music, or maybe its the carefree, other wolrdly charm of the French quarter. Come to think of it, its probably a mix of all three. Whatever the case, Madd Mike played on into the wee hours of the morning as crowd after crowd of drunk people filed by, occasionally stopping to throw in a few bucks or engage us in conversation. It is in the early morning hours that I most love that city, it is then that we see her quieter, deeper side. You would think there would be a lot of violence and general chaos at this time, but oddly there is not. I have always felt a strange sense of safety and well being there. After hours of partying people start to mellow out a bit, they stumble out of the bars and down the streets, pensive, alone with their thoughts and searching for meaning in life. You see all kinds, from the lonely drunken hobo to the lonely drunken millionaire. Often they stop to listen to the many talented street musicians who play freely around the quarter. At one point in the evening a very obviously wealthy, and well groomed looking couple came and sat down. It was a bit amusing to see this man, in his expensive designer suit sit down on the street next to Mad Mike and proceed to tell him what a miserable life he had. He lived in L.A, he explained, working in the " movie industry " and he and his wife were here on vacation, the first one in a long time he noted. He talked about his job and his dreams, and wondered out loud if he had made the right choices in life. At one point the fellow asked Mad Mike if he had his choice would he rather be here doing what he was doing or in L.A. living the good life. Unfortunately, I didn't here Mikes answer, but I was struck by something. What does one really need to be happy ? Does money make one happy ? What defines success ? Is the individual with lots of money, a shiny SUV, two car garage and a great paying job more succsessfull than a hobo who spends his days riding the trains, sleeping in farmers fields and fishing in lakes and streams ? What is "happy" anyway and is it even realistic to think that one can acheive it continually ? Maybe I am naive, or maybe it's my age (people have been telling me that since I was eighteen ). It could be that as I grow older I will change my view on these matters. However, right now, going on 33, this is how I see things. I contemplated all this and more as we said goodbye to Mad Mike and the other friends we had made. We stopped in one particular bar to dance for a bit, a handful of tired looking locals sat scattered at darkened tables throughout the room, while before them the most amazing blues band played in perfect time and rhythm. We danced for a bit, tipped the band, then walked back to the bus for the night. The next morning we arose early, and enjoyed a plate of beneights at the famous Cafe dumonde, then headed for the bus and interstate 10. We drove away reluctantly, promising to come back soon.